There are several common situations whereby a Whirlpool Cabrio dryer will not start. They include problems with the power supply, incorrect settings selected on the control panel, or issues with the dryer's setup. Before calling Whirlpool for repair you can try to resolve the problem yourself using some manufacturer-recommended troubleshooting steps. This approach can save you money if it prevents the need for a repair visit. Troubleshooting your Whirlpool Cabrio will take about 15 minutes. 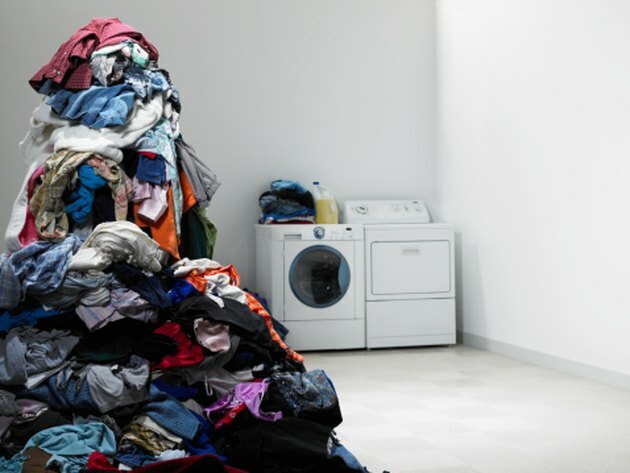 A broken dryer can cause your laundry to pile up. Troubleshoot it to see if you can correct the issue. Verify that the dryer is still plugged into its outlet. Vibration from laundry cycles can cause the power cable to work loose and cut off the electricity supply. Firmly push the plug into the outlet. Ensure that your household fuses or breakers are active. Whirlpool Cabrio dryers use two time-delay fuses to power up and spin. If one of the fuses has blown, the dryer may come on but not spin or dry. Replace any blown fuses and reset any breakers before trying your dryer again. Push the dryer door to make sure it is tightly closed. The Whirlpool Cabrio will not start its drying cycle if it detects that the door is open. Ensure that the door has clicked shut, and start your cycle again. Press and hold the "Start/Pause" button for up to five seconds. Some large laundry loads can be started only by holding down the start button for several seconds. Contact Whirlpool if your dryer will not start after completing these troubleshooting steps. You may be entitled to free service if your dryer is within its warranty period. Contact Whirlpool at 800-253-1301 in the United States or 800-807-6777 in Canada.